Episode 63 of CrossFit Radio was aired on Wednesday, April 29, 2009 at 6 p.m. PDT. 02:50 Scott Hartley is running less and winning more. He recently won the Masters Indoor Nationals in both he 800 meters and the mile in the M45 category. Much of his training is based on CrossFit. His training log looks quite different from the logs of other runners. Michael, Cindy and Fran are a big part of how he prepares for races. Conrad Schaefer of CrossFit Eaton is Conrad’s coach. He joins the discussion to tell the story of how difficult it was to get Scott to squat. But now it’s paid off, big time. 25:23 There has been some heated discussion lately on the affiliate blog. At issue is the slow response from some affiliates in signing up for the CrossFit RRG. Neil and JJ read excerpts and offer their thoughts. 26:40 Michele Vieux placed fifth at the Southern California qualifiers for The CrossFit Games. Michele discusses how she did it and how important a role nutrition played. 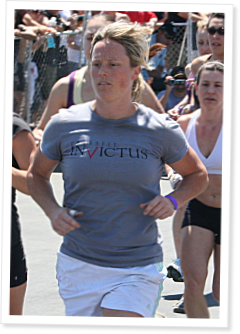 Michele is also a trainer at CrossFit Invictus and the owner of Mmmm Good Foods. She talked about running this successful zone meal catering business, how it got started, and where it's going. Episode 67 of CrossFit Radio aired Wednesday, May 13, 2009 at 6:00 p.m. PDT. This is the fifth episode of CrossFit Radio that aired 8AM PDT on October 19th, 2008. This is the 26th episode of CrossFit Radio, which aired at 6pm PST on January 28th, 2009. I think that this would be a GREAT companion to the Nutrition Cert. Day 1 Robb Wolf Day 2 Michele Vieux, which would include some cooking, recipe review, and a cookbook. Think it would be great!